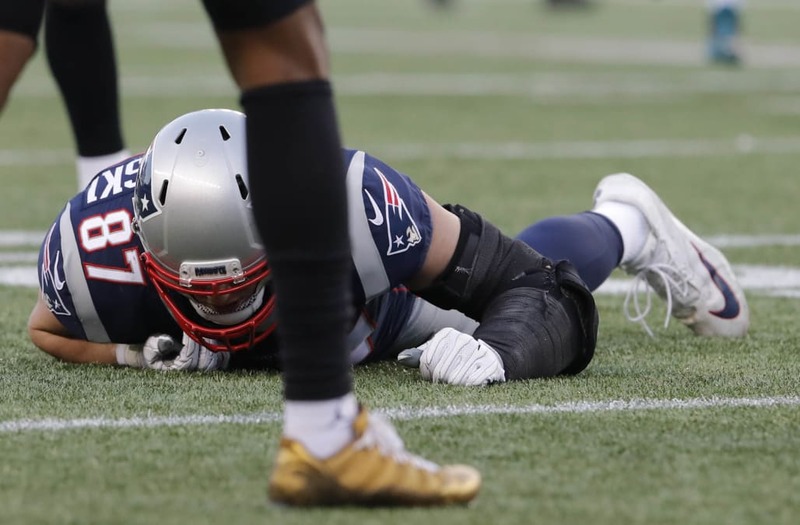 Tight end Rob Gronkowski was still sidelined by a concussion in Thursday's practice, the first on-field preparation for Super Bowl LII for the New England Patriots. Gronkowski suffered a concussion in the first half of Sunday's AFC Championship game and is listed on the injury report with the injury. No update is expected on his condition until at least the weekend. Quarterback Tom Brady, who played with a lacerated and bandaged right thumb against Jacksonville, is not on the injury report and took the field with the Patriots on Thursday wearing two gloves, just as he did last week. Defensive end Deatrich Wise (concussion) and defensive tackle Malcom Brown (foot) were not spotted Thursday during the portion of practice that was open to the media. New England will practice in Eden Prairie, Minn., on Monday after arriving for Super Bowl LII. The Patriots are scheduled to practice in Foxborough for the rest of this week. Gronkowski, 28, led the Patriots in receiving in the regular season with 69 catches for 1,084 yards and eight touchdowns.